Huzhou (help·info) is a prefecture-level city in northern Zhejiang province, China. Lying south of the Lake Tai, it borders Jiaxing to the east, Hangzhou to the south, and the provinces of Anhui and Jiangsu to the west and north respectively. At the 2010 census, its population was 2,893,542 inhabitants, of whom 757,165 lived in the built-up (or metro) area made of Wuxing District as Nanxun District is not being conurbated yet. Huzhou, in its general aspect, is in the center of the Yangtze River Delta Economic Area, with the city center 10 km (6.2 mi) south of Lake Tai (the third largest freshwater lake in China). There are transportation links to the provincial capital of Hangzhou 78 km (48 mi)away in the south, Jiangsu and Anhui province in the west, and the metropolitan municipality of Shanghai 150 km (93 mi)to the east. Flowing quietly through the city is the Changxing-Huzhou-Shanghai Channel. It is also referred to as the "Eastern Rhine River" for the continuous barge transportation that goes on similarly to the more internationally known Rhine River in Germany. The State Way 318 passes through Huzhou in an east-west direction and the State Way 104 in a north-south direction; the Nanjing-Huzhou-Hangzhou toll expressway and Shanghai-Jiangsu-Zhejiang-Anhui toll expressway offers convenient access to major areas in the region. The Express Xuancheng–Hangzhou Railway Station is located 8 km (5.0 mi)west of the city center. This railway line is part of the "secondary tunnel" in eastern China. 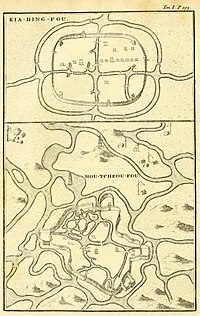 The map of "Kia-hing-fou" and "Hou-tcheou-fou" in Du Halde's 1736 Description of China, based on accounts from Jesuit missionaries. 248 BC, Gucheng County (菰城縣) was set up by the State of Chu. 222 BC, Qin dynasty, Wucheng County (烏程縣) was set up. 266, Kingdom of Wu, set Wuxing Shire (吳興郡), its administrative area including the modern Huzhou prefecture city and Hangzhou, Yixing in modern-day Jiangsu. 602, Sui dynasty, changed the name of Wuxing to Huzhou (湖州). During the Tang dynasty, Huzhou administered 5 counties: Wucheng (烏程), Wukang (武康), Changxing, Anji, and Deqing. At the beginning of the Song dynasty, Gui'an county (歸安縣) was divided from the Wucheng county. During the Qing dynasty, Huzhou administered 7 counties: Wucheng, Guo'an, Wukang, Deqing, Changxing, Anji, and Xiaofeng. 1949, with the establishment of the People's Republic of China, Huzhou town became the seat of government of the First Special District of Zhejiang, administrative area including the modern Huzhou and Jiaxing prefecture cities. 1983, Huzhou prefecture level city was set up. The prefecture-level city of Huzhou administers six county-level divisions, including one economic development zone and two districts and three counties. These are further divided into 66 township-level divisions, including 50 towns, 10 townships and six subdistricts. Huzhou is known as the City of Silk, is one of the Four Capital-cities of Silk in China. Textiles (especially silk), building materials and agriculture. Huzhou is headquarters of the 1st Group Army of the People's Liberation Army, one of the three group armies that comprise the Nanjing Military Region responsible for the defense of China's eastern coast. The Lotus Garden (pinyin "Lianhua Zhuang") is a pleasure garden located 20 minutes south on foot from the city center of Huzhou. The main attractions of the garden include the Lotus flowers that bloom seasonally in the three lake system, a large Koi pond near the north gate, a karaoke veranda and amusement rides for children. Also, barge-themed pedal boats are available for leisure boating. The garden was built in 1924 with stone footpaths and bridges bordering and crossing over the lake system. A variety of structures inhabit the 300 meter squared grounds including two halls, six pavilions, and two inlets, all following the harmonious design of traditional Chinese architecture. Sign posts describe local history and the halls maintain a Tea House where visitors may converse and take a break from the rays of the sun. A particular geological feature worth seeing are the ancient stones transferred from Lake Tai. Families pour into the garden on public vacation days while local people partake in Taiji exercise, or play card and Mahjong games every day, year round. The garden is open during daytime hours and admission is free of charge. Xiangwang Park (Southwest Gate Park) is a more recent addition to Huzhou's collection of historical parks. 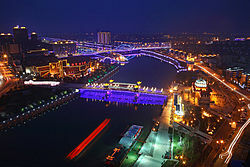 It was built in 2009 and located at Chen Bei Bridge. The park includes the rebuilt wooden gate outpost on top of the original defensive wall. A visitor ship is permanently moored one kilometer west of the historic gate. Long Island Park (pinyin "Changdao Gongyuan") is a new park just north of the city center on an island stretching north-south in the middle of Xitiao River. It was built in 2009. The park is open every day. A popular destination for local residents after dinner, the lengthy route becomes something of a promenade for people taking their daily constitutional through the form of a jog or, more commonly, a walk. There is a small golf park, a historical pool, and a garden available to visitors. Zhu Zhi 朱治 (156–224) and Zhu Ran 朱然 (182–248), military general for the Kingdom of Wu during the Three Kingdoms era of China. Shen Yue 沈約 (441–513), prominent scholar of the Liang Dynasty and author of the Book of Song宋書. Chen Baxian 陳霸先 (503–559), founder and Emperor Wu of Chen dynasty 陳武帝. Lu Yu 陸羽 (733–804), sage of tea, author of the Classic of Tea. Zhao Mengfu 趙孟頫 (1254–1322), great calligrapher in Yuan dynasty. Yu Yue 俞樾 (1821–1906), scholar. Shen Jiaben 沈家本 (1840–1913), Late Qing Chinese scholar and jurist. Wu Changshuo 吴昌硕 (1844–1927), great calligrapher. Chen Qimei 陳其美 (1878–1916), revolutionary, member of Chinese Tongmenghui. Chen Guofu 陳果夫 and Chen Lifu 陳立夫 are nephews of Chen Qimei. Lei Zhen 雷震 (1897–1979), politician and political analyst of the Republic of China. Dai Jitao 戴季陶 (1891–1949), politician of the Republic of China. Zhu Jiahua 朱家驊 (1893–1963), politician of the Republic of China. Qian Sanqiang 錢三强 (1913–1992), scientist in Chinese atomic bomb study; and his father Qian Xuantong 錢玄同 (1887–1939), scholar. Tu Shou'e 屠守鍔 (1917–), scientist and rocket designer. Huzhou is well known as one of the birthplaces for silk cultivation. In 1958, a great number of silk, silk ribbon and uncarbonized tablets were found in the southern suburbs of Huzhou. Scientists from the Institute of Archaeology measured these silk products carefully and determined the age of the silk to date back 4700 years. Now, these silk pieces have become the greatest treasures of the Zhejiang Silk Museum. Huzhou silk has many desirable features, such as paleness in color, luster, flexibility, and roundness in shape. As a result, Huzhou silk has been respected and desired for a very long time. The history of Huzhou silk can be uncovered back to the time of the Warring States (474 BC –221 BC). By the time of the Southern and Northern Dynasties (420 AD – 589 AD), Huzhou silk had already been exported to more than ten countries. During the Tang dynasty (618 AD – 907 AD), Huzhou silk was chosen for an imperial tribute, thus marking the first prosperity in silk production. With the establishment of the Ming dynasty (1368 AD – 1644 AD), the residents living near Lake Tai entered the profitable textile industry, resulting in a larger workforce and a refinement of Huzhou silk products. Huzhou silk has won awards at World Fairs, and is desired by clothing and furnishing manufacturers overseas. Huzhou has a long history of manufacturing ink brushes, and it can be traced back to the Qin Dynasty. Huzhou's ink brush production and manufacture gained prominence in the Ming Dynasty (13th century). Since the late 20th century, Huzhou has been known as the "Hometown of the Ink Brush". Huzhou also holds an annual "Huzhou Ink Brush Festival", and the festival also has some memorial activities dedicated to Meng Tian - the inventor of ink brush pen. The most famous brush pen workshop in Huzhou could be the Shanlian (善琏; Shàn Liǎn), thus its brush pens are named Shanlian Hubi (善琏湖笔; Shànliǎn Húbǐ) in reverence of this workshop. Shanlian is also a local place name, whose ancient name was Mengxi (Chinese: 蒙溪; literally: 'creek of Meng Tian'). Meng Tian made brush pens there. ^ "Radom - Miasta partnerskie" [Radom - Partnership cities]. Miasto Radom [City of Radom] (in Polish). Archived from the original on 2013-04-03. Retrieved 2013-08-07. ^ "Cabo Frio e Huzhou, na China, fecham acordo e se tornam cidades irmãs" [Cabo Frio and Huzhou in China close deal and become sister cities] (in Portuguese). Retrieved 2018-05-05. ^ "huzhou silk history." baidu. baidu, 09 May 2009. Web. 30 Oct 2013. <http://zhidao.baidu.com/link?url=CM4uZMECsupncKVKYyTqYMeoFtCAK1AfMw2LwhBsCKTexNGe2thEvG89mxTFhm2bq-xYtNUKF_L0F36GXI-t_q>. ^ "Zhoushengji dumpling." Baidu bai ke. baidu, 07 Sept. 2012. Web. 30 Oct 2013. <http://baike.baidu.com/link?url=k203n4zx2KUGhndt4GckwM_B6sPuzpjOsuFo5gYqwh5MKXeBhL6zo9-h05_bw6zg>. Wikimedia Commons has media related to Huzhou. "Hu-chow-fu" . Encyclopædia Britannica (11th ed.). 1911.